Rhoelyn: Nysse is woken by a nose nudging her. She can hear Rhese’s voice calling for her. “Nysse!” She bites her lip within the tight tree hollow. Rhoelyn: “I know, alei.” The huntress hesitates, but Vorok kicks her. Nysse yelps and glares over her shoulder at the wolf. Yami merely grins happily. Araatris: A few dozen yards away, Rhese growls and shouts, “Nysse, if I have to sniff you out-… Oh, the things I will do to you!” Vorok snorts once more. Rhoelyn: Nysse glances at Yami and clears her throat, calling out, “I’m in the tree hollow over here!” Her chain chimes as she wiggles to face the exit. Araatris: The druid waits, leaning against the tree as she manages to pull herself free of the tangle of wolves and boy. His arms are crossed, brow furrowed. Rhoelyn: The huntress winces and looks down. “I f-fell asleep…” She bites her lip nervously. “I meant to come b-back earlier.” Nysse listens as he moves. Rhoelyn: Nysse shifts uneasily from foot to foot, unsure what to do. “Are you angry with me? She timidly reaches out for him when he straightens. Rhoelyn: She nods nervously, but turns to the hollow. “Yami, I’m going with Rhese. Please head back to camp.” “I will, min’da.” The boy smirks knowingly. Araatris: Rhese laughs and gives her a squeeze, “Nysse, you are easy to please.” They step free of the trees to see a brook flowing between tall boulders. Araatris: “Of course not,” he chuckles and pulls her close. “But I promise you can hide behind me if they do.” He starts tugging at the ties on her kilt. Rhoelyn: Nysse blushes. “Rhese!” Her desire to bathe overwhelms her nervousness as they disrobe. By the end, she’s impatiently looking at the water. 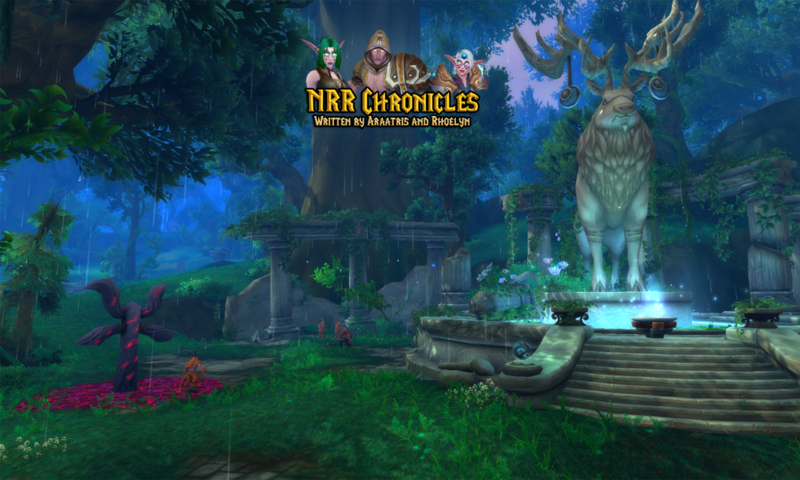 Araatris: “Your bath, my lady.” The druid looks amused as he wades into the water, giving her some space for what is clearly at the top if her mind. Rhoelyn: Tugging her green hair over one shoulder, she wades over, trying to ignore her burning cheeks. “I’d like that. Did I get the dirt out of my hair? Araatris: “Hm,” he says with a smile, straightening from his indolent posture to run his fingers through the wet mass and smooth it along her collar bone. Rhoelyn: Nysse stammers, “R-rhese, you’re staring. Did I miss something?” She glances down at her hair. Rhese chuckles and the huntress bites her lip. Araatris: “You definitely missed something. Should I help you?” His grin as he leans toward her is playful. Until he pauses, blinking, and looks away. Rhoelyn: The young woman frowns in confusion at his change in demeanor. “Surfal? Is s-something wrong?” She clutches her hands in front of her chest. Araatris: “Something is off. Do you feel that?” Rhese frowns and goes still, sifting the air with his senses. After a moment, he turns away from her. Araatris: The druid finally glances back at her. “I don’t…-” Behind him, the water over the waterfall begins to dribble through with something dark and thick. Rhoelyn: The huntress grabs his wrist and tugs him to the shore. “Out now! Questions later!” She glances over her shoulder with wide eyes at the substance. Araatris: As he laces up his breeches and reaches for his tunic, the druid shakes his head. An eerie glow starts at the center of the substance. Araatris: The inky water surges toward them with what can only be called a wail, a vague face forming as it reaches for the two of them with clawed hands. Rhoelyn: Rhese grabs Nysse’s wrist pulling her out of the way of something she doesn’t quite see. He hurries her down the shore, looking for something. Araatris: Whatever the creature is, it surges along the brook after them, enraged and persistent. Rhese curses again, dodging away from watery claws. Araatris: “No, don’t-!” When the huntress starts to dart through a thinner spot in the foliage, a shock of energy drags through her. Rhese tugs her back. Rhoelyn: The huntress stumbles into him and he quickly yanks her down the shore. “W-what was that? Are we being herded? !” They dodge another swipe. Rhoelyn: The inky brook creature grabs Nysse’s leg and yanks her toward it. “Rhese!” The druid stumbles in an effort to keep a grip on her wrist. Araatris: Shifting to the cat, he darts past her and slashes his claws at the creature’s arm. The water wraps around his paw instead of being disrupted. Rhoelyn: They struggle as it creeps up their bodies and pulls them closer. Nysse slashes at it with her dagger, but the weapon is yanked from her grasp. Araatris: Rhese yowls and lifts his feline head, magic surging as arcane moonfire slices into the heart of the inky water, sending liquid flying. Araatris: He fails to answer her, pacing around the trunk of a tree and catching it with one hand. He leans out, hanging at an angle as he considers them. Rhoelyn: Nysse brandishes her dagger and the man catches her wrist smoothly. Rhese growls, “Get your hand off her.” There’s shouting in the distance. Araatris: “And you manage to ask new ones every time.” The black-eyed human chuckles even as he whips his hand forward against Rhese’s bare chest. Rhoelyn: The druid grabs his wrist and snarls, but the human’s fingers brush against his skin anyway. Rhese cries out as something is drawn from him. Araatris: “Rhese!” Nysse screams his name as the druid drops to his knees, releasing the man, who steps away, shaking away power that looks Lightborn. Rhoelyn: Nysse wraps her arms around her mate, glaring up at Tadanir. “We won’t go down without fighting.” Korran forms protectively in front of them. Araatris: Tadanir laughs. “He is out of th-” The druid’s feral growl interrupts him, and Rhese raises his head, eyes black and scars dancing across his skin. Rhoelyn: Nysse spins around just in time to watch the druid shift into a large black wolf and leap past her. “Rhese! Stop!” He collides with Tadanir. Araatris: The man actually looks surprised as he falls under the wolf’s claws and teeth, and he throws his arms up to protect his face. Korran growls. Rhoelyn: “Go.” Korran leaps forward biting at the man’s legs while Rhese claws and snaps at his face. Nysse grimaces and leans against a nearby tree. Araatris: “A-ah!” The huntress cries out as pain wracks her body. Confused, she looks down at her shaking hands to find lighter versions of Rhese’s scars. Rhoelyn: She shrieks as the magic tears at her, shifting her, leaving a green and brown wolf. The wolven Nysse staggers to her paws, snarling at Tadanir. Araatris: “No!” The strange human screams in pain as Rhese’s vicious fangs pierce his armor, sinking into his side. Nysse rushes forward as Korran fades. Rhoelyn: “You’re the true mirrors of the timeline!” The black eyed man tries to kick Rhese away, but Nysse bites and shakes his leg with a loud crack. Araatris: The black wolf withdraws just long enough to snarl viciously before he lunges in and ends the man with a quick motion. Blood drips from his muzzle. Rhoelyn: Nysse yelps as the body dissolves into a pile of goo. Rhese huffs and turns back to the huntress, nosing her. Her ears droop meekly and she whines. Araatris: His affection smears her fur with blood as he rubs his head against her, trying to be reassuring. Alarmed voices approach them, and Rhese snarls. Araatris: The young human gapes, gasping under her breath. “Th’Alpha…” Wrune’s eyes go wide when she kneels before the bloody wolves, bowing her head. Araatris: She turns away from him, stretching out a hand toward Rhese. When she steps forward, Leo stops her. “He doesn’t look right.” “I know,” she says. Rhoelyn: “Brother, come back to us. Do not let the curse control you.” Rhoelyn cajoles softly. The large wolf looks over his shoulder at Nysse and Rylana. Rhoelyn: The wolf growls, barking at Nysse. She raises her head and darts quickly behind him. Rhoelyn sinks to her knees and holds out her hand. Araatris: As he pads warily toward her, Nysse following, his sister speaks soothing words in Darnassian. He finally presses his black nose to her palm. Rhoelyn: Nysse whines and nuzzles against Rhoelyn’s legs. It’s a tense moment as Rhese bares his teeth, but he shifts, clutching his sister’s hand. Araatris: Rhoe wraps her other arm around Nysse as the huntress’ own slow, clumsy transformation trails Rhese’s and fills her with pain. Nysse sobs. Araatris: As the rest depart, Ry shoots one last glance back to watch Rhoelyn press her forehead gently against her brother’s, whispering foreign words. Rhoelyn: Aron nods distractedly as she runs off. It’s only a few minutes before she returns with the other paladin in tow. Relare kneels on her other side. Araatris: The blood elf assesses her with a quick glance, and lays one hand on Wrune’s arm. “I’ll follow your lead.” He rests the other on Nysse’s waist. Araatris: Wrune steadies her when she reels. “Relax. He’s fine. Rhoelyn is taking care of h-” A pained shout rings out in the distance, cutting off abruptly. Rhoelyn: Nysse cradles him. “I know, Yami. Everything will be okay.” Her fingers run through his silver hair soothingly. Wrune leans back with a long sigh. Rhoelyn: “Goodnight, sweetie.” Nysse smiles. “You’re right. I’m sure he will be, too.” As they settle in to rest, Wrune covers them with a light blanket.